Singapore is a young nation, a high-functioning capitalist culture valuing commerce and uniformity, where, my producer Grace Khoo tells me, she was raised ‘not to ask questions, to keep my chin down and not to stand out.’ It is recently embracing notions of diversity and inclusion, but its awareness of disability issues and culture are very much in its infancy. How challenging atypical embodiment, disability politics, the aesthetics of access and what I call ‘alternative dramaturgies informed by a d/Deaf and disability perspective’ may be here, I’m about to find out. 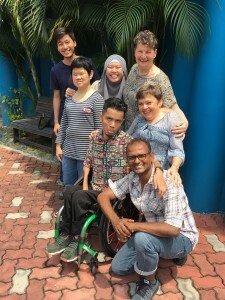 Kaite O’Reilly is an award winning playwright, currently working in Singapore with an international Unlimited Commission, embedding work by Deaf and disabled artists in the cultural sector. Author Website. Pictured: the author and performers outside rehearsal (small image).